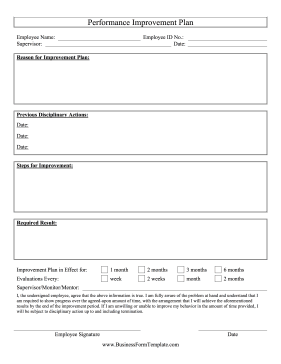 This performance improvement plan helps struggling or underperforming employees raise the standard of their work. I, the undersigned employee, agree that the above information is true. I am fully aware of the problem at hand and understand that I am required to show progress over the agreed-upon amount of time, with the arrangement that I will achieve the aforementioned results by the end of the improvement period. If I am unwilling or unable to improve my behavior in the amount of time provided, I will be subject to disciplinary action up to and including termination.